Although big trap muscles look impressive, when training their shoulders, athletes often overlook them in favor of their deltoids. That’s a mistake. Delts are extremely important to develop, but you must pay attention to your traps to round out the shoulders. Traps are used for holding and supporting the neck, lifting the shoulders, rotating the shoulders, lifting the arms and assistance in deep breathing. Barbell Shoulder Shrugs and Upright Rows are mainstays for trap work, but additional exercises add variety to a trap routine. They include Behind-Leg Barbell Shoulder Shrugs, Dumbbell Shoulder Rotations, Close-Grip High Rows and Seated Nautilus Machine Shrugs. These exercises have many variations, allowing bodybuilders to hit their traps from many angles. Anything you can do to a muscle to which it is not accustomed tends to stimulate growth. The following routine is based on the HIT (high intensity training) protocol, which is the type of training I deal with in all of my books. It is founded on the principle that the more intensity you place on a muscle during training, the lower the set count—or volume—must be to avoid overtraining. To derive the most benefits from this system, take all sets to complete muscular failure. If you don’t, your muscles will not receive enough stimulation to grow larger and stronger. Some sets focus on developing strength and power, while others increase strength and size of the traps. Use a heavy weight for the Shrugs. After completing 6 reps, do a series of four static holds, one at the bottom for 10 seconds, one at mid-point for 10 seconds, and two at the top for 10 seconds. Put the bar down for a 10-second rest between holds. 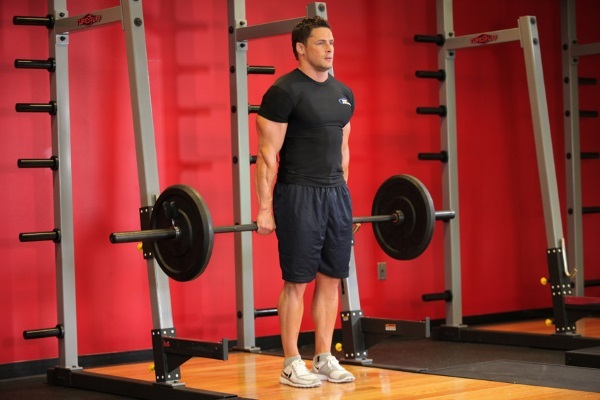 Perform Dumbbell Upright Rows with a slow tempo, focusing on an extended increasing contraction. Perform Cable High Pulls with a strap or rope handles on the middle position of a cable machine. Pull the handles straight back until they touch the bottom of your neck. Squeeze hard at the top of the rep before returning. Perform One-Arm Angled High Cable Rows by attaching a handle to the low pulley and standing in front of the machine. Pull the handle up at an angle to shoulder height. Squeeze hard before returning to the bottom. For Dumbbell Shoulder Rotations, use a dumbbell in both hands held at shoulder height, parallel to the floor. Rotate the dumbbells clockwise for 15 reps before changing to a counter-clockwise motion, completing 15 reps. Seated Nautilus Shrugs can be done on an old Nautilus machine, or you can do regular Dumbbell Shrugs. Sit on the machine and place your hands in the pads, palms-up. Shrug your shoulders as high as you can and hold for one second before returning. Repeat. Alternate these routines every other week, training your traps hard once per week. It is ideal to train your traps with your back on days separate from your delts.